6 Beds 5 Baths 1 Partial Bath 6,350 Sq. ft. 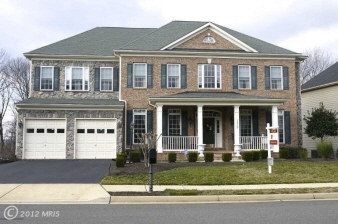 Description: This home is one of the largest models in broadlands, boasting over 6,000 sq/ft including w/o basement,gourmet kitchen(hickory cabinets,granite counters,5-burner cooktop,stainless) sound system thru out entire home, oversized 2 car garage,built-in shelves in garage and basement, UV tinted windows in FR and foyer window,faux stone fp,main level bedroom, custom tile in all baths & so much more, see full list! This 6BR/5. home is one of the largest models in Broadlands, boasting over 6,000 sq/ft including w/o basement, gourmet kitchen with hIckory cabinets,granite counters,5 burner cooktop, stainless appliances, double ovens, mudroom off kitchen with laundry & surround sound system through out entire home. Oversized 2 car garage, built-in shelves in garage & basement, UV tinted windows in FR and foyer, faux stone FP, Main lvl BR with separate bath, custom tile in all baths, plantation shutters on kitchen & Rec-room door, Custom window treatments and blinds, hardwoods in Foyer, kitchen, hallway, and stairs. Partially finished lower level with bedroom, enormous game room, full bath and exit out to private wooded lot with stamped concrete patio!